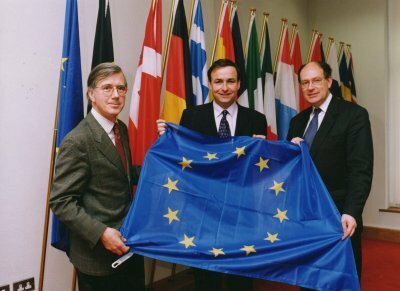 Yesterday marked the start of the British presidency of the European Union’s Council. The presidency rotates among the member states with six month intervals. The logo of the British presidency is a flock of wild geese. This logo strikingly resembles a logo of the Eurosceptic Bruges Group. The Bruges Group was established in the historic Flemish town of Brugge in 1989, one year after Mrs. Thatcher held her famous speech there, rejecting a federal Europe and proposing instead a decentralised Europe of independent, freely-trading and cooperating nation states. I happened to be present at the launching of the Bruges Group in 1989 as one of the few journalists who had considered the event interesting enough to attend. As far as I recollect the Group was established to promote friendship and voluntary cooperation between sovereign European nations working together effectively for a better future. Given that flying geese elegantly mark Britain’s leadership in Europe it is perhaps no coincidence that the two logos resemble each other. If we may suggest Jack Straw an adequate explanation which might prevent Lord Lamont from demanding compensations, the Foreign Secretary could tell him that the Blair government, too, has realised that Margaret Thatcher was right all along in asserting that Britain should lead the flock of free and sovereign European nations. And now that we are discussing the issue of logos: breach of copyright is indeed a serious matter and the official EU flag is an almost perfect copy of part of the Betsy Ross Flag, the oldest US flag. The only difference is that the EU flag has twelve stars and the Betsy Ross Flag had thirteen. 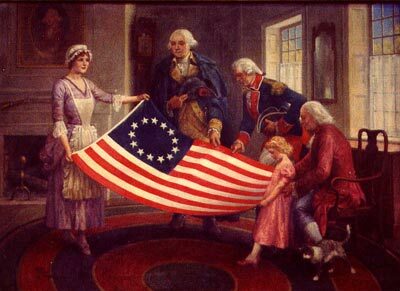 May we suggest that the United States sue the European Union for its flag, unless Brussels provide the adequate explanation that by copying the first American flag it is simply indicating its wish to create the new Europe in the image of the old America – the pre-1787 America that is, when the US was still a confederation.